and its subsidiaries & affiliates. 2007 The Governor ordered that properties be numbered. 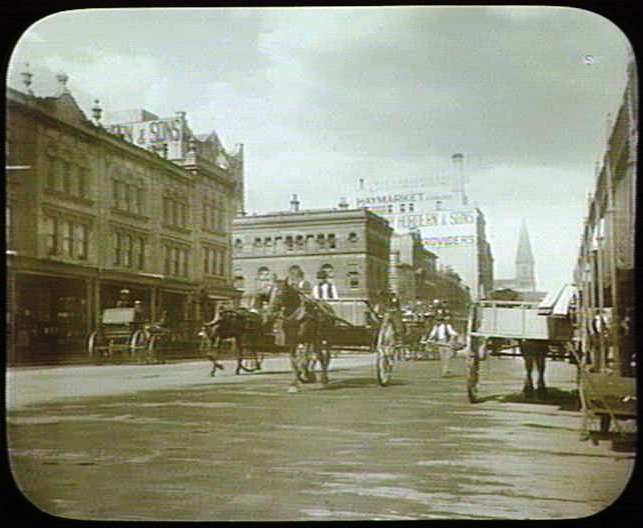 Properties began to be numbered starting with George St Sydney. c) Streets are numbered from North to South or West to East. 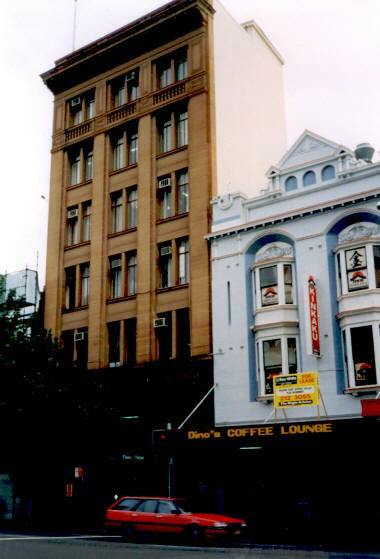 Location is part of the City of Sydney RSL Club (567-561 George Street), and at left of the Sir John Young Hotel on the corner at 557 George Street. 2007 March location photo by John Ness. 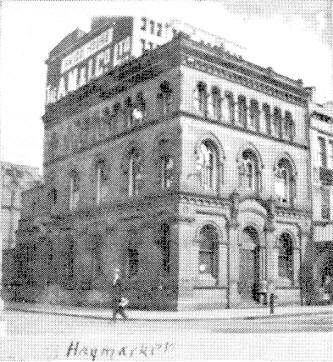 Later moved Southern Branch to 744 George Street, The Haymarket. 1924 building was commissioned by CBC. The architects were Kent and Massie. 1925 building was constructed. Builders were Stuart Bros.
1930s some alterations of an unknown nature during the 1930s there are few other recorded alterations except the installation of an automatic teller in 1985. 1934 Listed in Century of Banking as 661-663 George St.
Bill Frost advised: The present building looks a bit like a minature Head Office. It had a very large basement with two strong-rooms and storage. It also had automatic pumps to keep Darling Harbour out. There was an hydraulic lift from the basement to the ground floor for carrying cash. 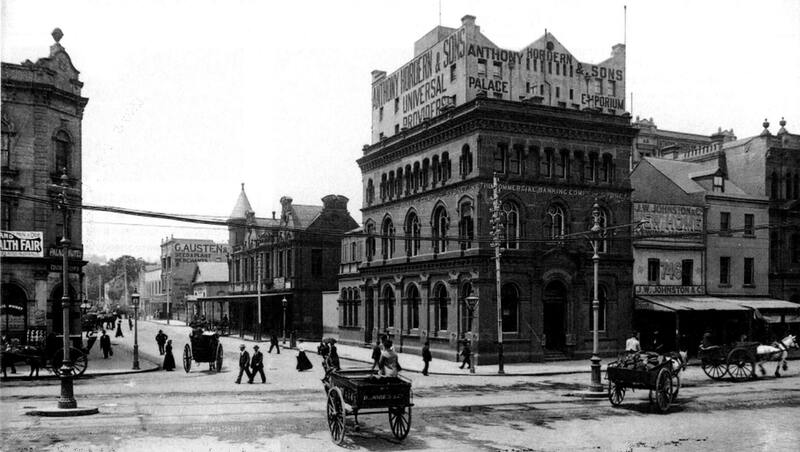 The other picture appears to be of the old premises which in my time there were on the other side of George St. The street numbers do not tally though. 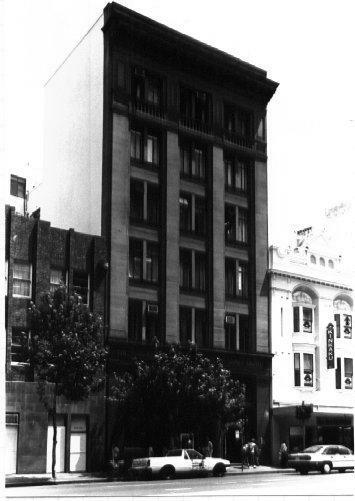 B&W photo by Sydney City Council, Heritage Listed. This building was commissioned by the bank in 1924 and constructed in 1925. The architects were Kent and Massie, and the builders were Stuart Bros. Apart from some alterations of an unknown nature during the 1930s, there are few other recorded alterations except the installation of an automatic teller in 1985. 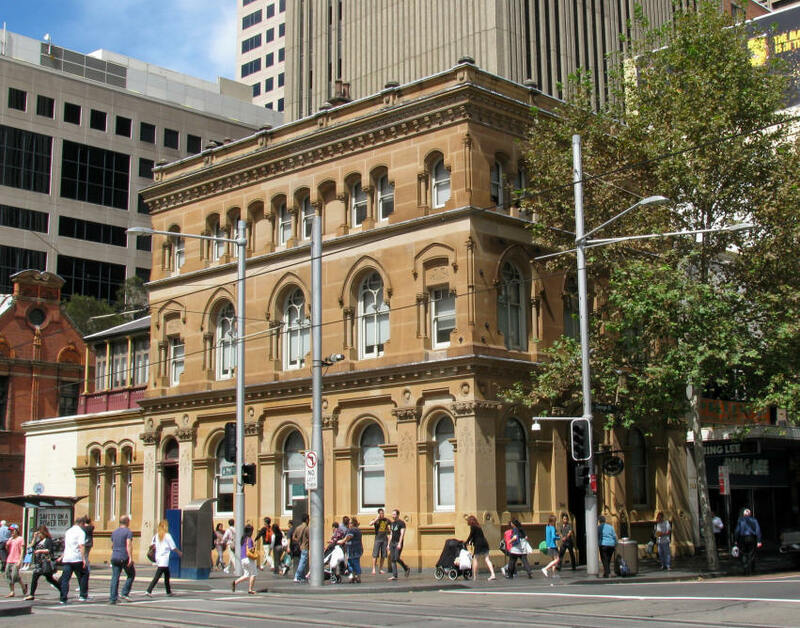 Archaeological Potential: Both the George and Sussex Street sandstone facades of the National Australia Bank have been well maintained with only minor cosmetic changes. They boldly express the Commercial Palazzo style. Grand internal spatial quality and classical detailing. 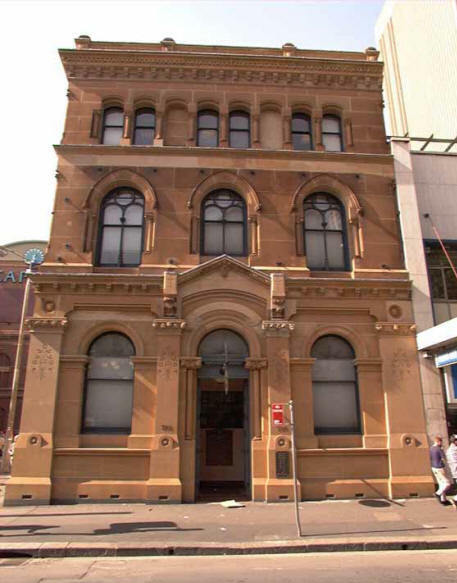 Significance: The George Street National Australia Bank is listed on Schedule 1 and the Heritage Streetscape Map in the Heritage LEP 2000. The bank records the popular use of the Commercial Palazzo style for CBD financial institutions in the 1920s. Generally it reflects an important period of city growth during this period. The National Australia Bank is a dignified and well proportioned example of the style as interpreted in the inter-war period. The mellow sandstone and trachyte base combine to make the building an important contributor to the townscape character of the CBD. The significance of this building is due, in part, to the high degree of external intactness of the facade, and internal intactness of ground floor banking chamber and George Street entry foyer. 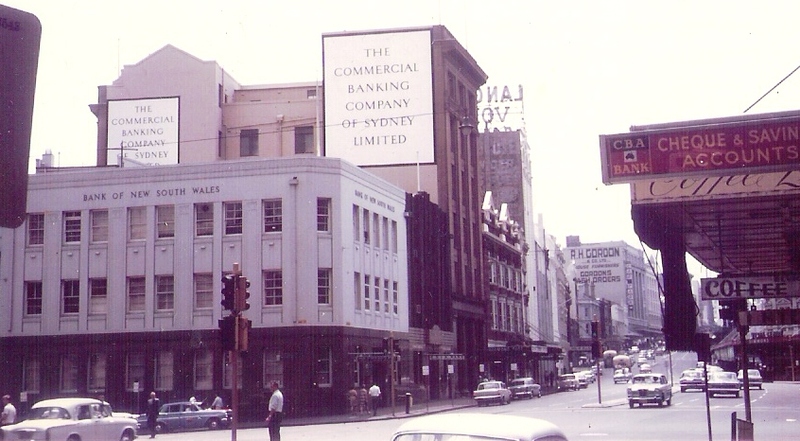 The George Street National Australia Bank was purpose built for banking activities and continues in that function, an association of over seventy years. Generally it reflects an important period of city growth during the 1920s-1930s. Has historic significance locally. [Aesthetic Significance] Has aesthetic significance locally. [Social Significance] The George Street National Bank is a dignified example of the Commercial Palazzo style characteristic of banks and financial institutions in the 1920s. The exterior is well preserved and presents to the street as mellow sandstone facade with an impressive street level trachyte base, well proportioned windows (top level with false balcony) and strong cornice. The form and scale of the building contribute to the surrounding townscape quality. The elaborate ground level banking chamber and foyer interiors have been well preserved. 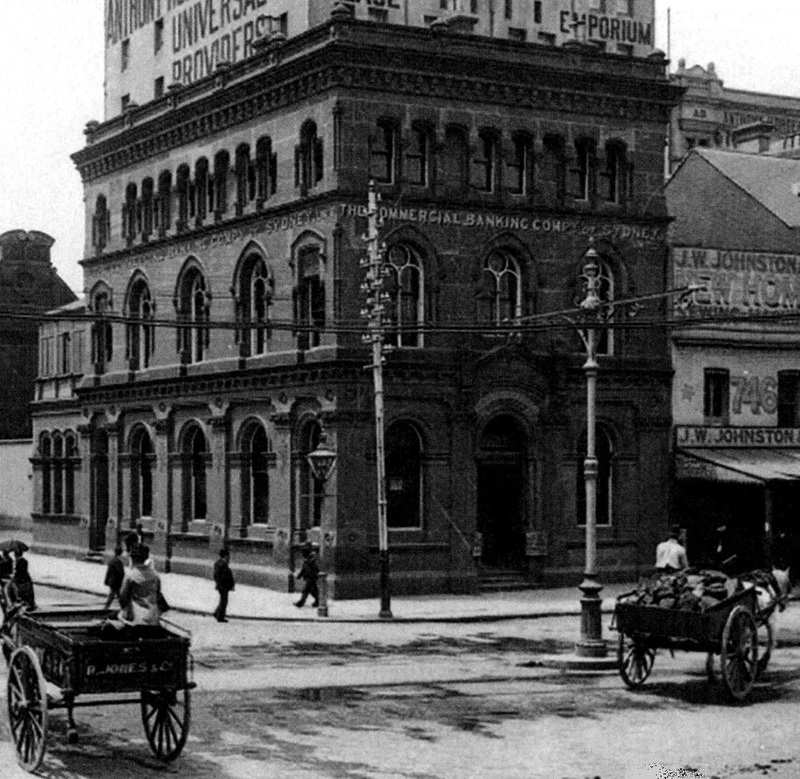 [Representativeness] The George Street National Australia Bank is representative of the popular Commercial Palazzo style as befitting the image of Banks and Insurance Company's in the 1920s. The interiors are still capable of interpretation with the banking chamber having changed little. 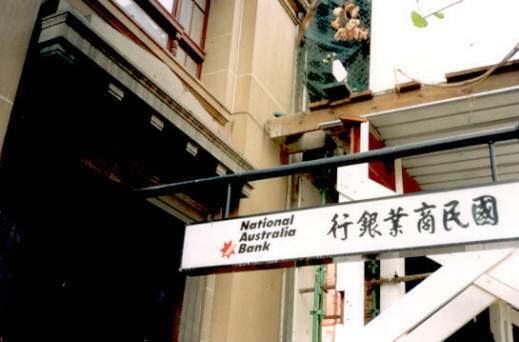 General: A Conservation Plan is required to guide future management, use and maintenance of the National Australia Bank given the high level of significance. The overall form of the building should be preserved. Exterior: Any future development should preserve the external fabric including sandstone and granite facings, windows, and gold lettered sign. Intrusive elements such as window mounted air conditioning units should be removed when the opportunity arises. Interior: The banking chamber interior, George Street foyer and surviving fabric to the upper levels should be preserved in accordance with the Conservation Plan. Adaptive reuse of interiors must also be in accordance with the Conservation Plan and any new work should be reversible having no physical impact on significant internal and external fabric. Future uses should have functional requirements of a similar nature to existing banking use to ensure compatibility. 1985 The only major alteration to the building since the 1930s was the installation of an Automatic Teller Machine. 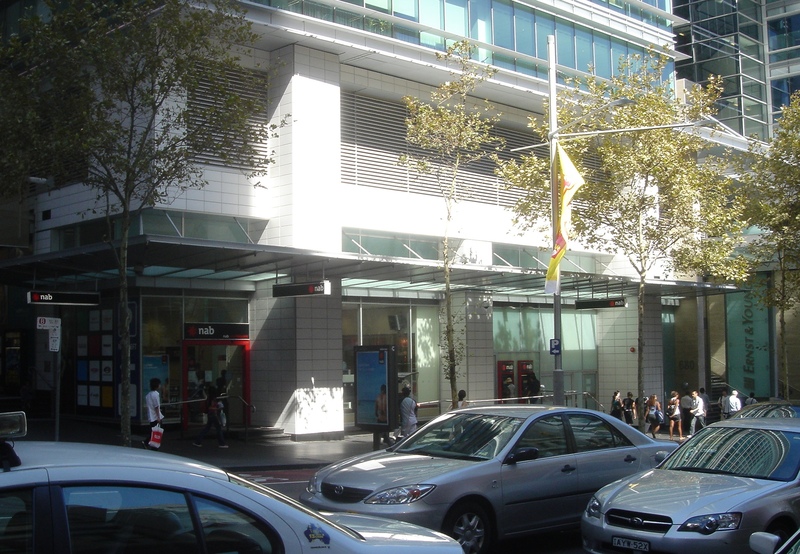 2006 closed by nab and business transferred to World Square on opposite side of George Street, closer to Town Hall. 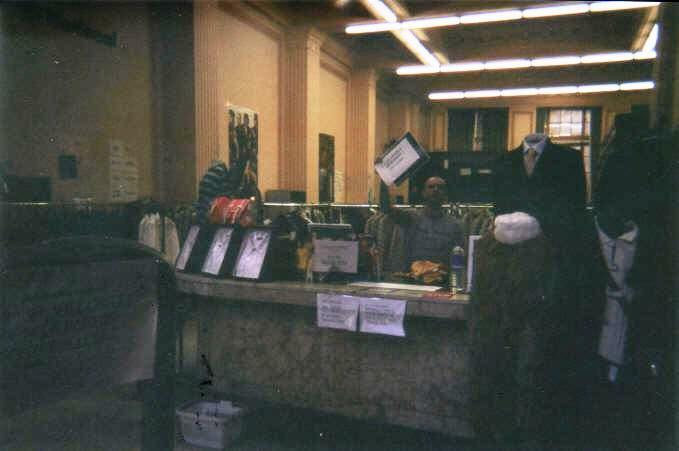 2006 October photo of interior as a tailor's by John Beer who says 1st floor is now occupied by CWA. 2009 January GoogleMaps photo sourced by John Beer. 2009 April, Sally Barnes-Cooke advised: The thought just occurred to me that the basement of 661 George Street was a maze of dark passages and cell-like rooms that nobody ever visited. I was told that the rooms were built as air-raid shelters but this might not be true. One of the rooms was stacked with old ledger books all written in beautiful copperplate writing. I don't know if these would be of historical interest or whether they would still be there after all this time, but as it appears nothing has been altered, they might be untouched! 2009 June Haymarket Ex-CBC about 661 George St has been transformed into Haymarket Hotel. John Beer reports: Hotel is owned by people who own at least two other hotels in the City. The boss said there was great difficulty obntaining approvals to have alterations done. In the area where CBC / NAB operated the bank, Haymarket Hotel operates on three levels ground floor then down one story & up one storey & there seems to be a mezzanine between ground floor and 1st floor. Ceiling is highlighted with lighting. Marble counter remains. CBC Bank history is highlighted including on plaque outside front and rear entrances, walls, wall counters (where deposit slips were) where it also states NAB made alterations to tellers boxes. The tenanted area operates separately as it did before with lift from basement to 5th floor. 12 noon 20090713 Monday the only 2 in Haymarket Hotel were John B & Hotel Manager after it had been opened for 3 weeks. 1910 (from Financial Reports) Gaden, C. W.
1936 – 1939 Sullivan, A. R.
1969 - 02/09/1974 Bellingham, N. F. ) Actual dates not known in most cases. 2010 Originally Savings Bank of NSW, now Bank of China. 2006 October photo by John Beer. 2010 June 3 photo of Sydney Chinatown Bank of China (c) Newtown grafitti on Flickr. 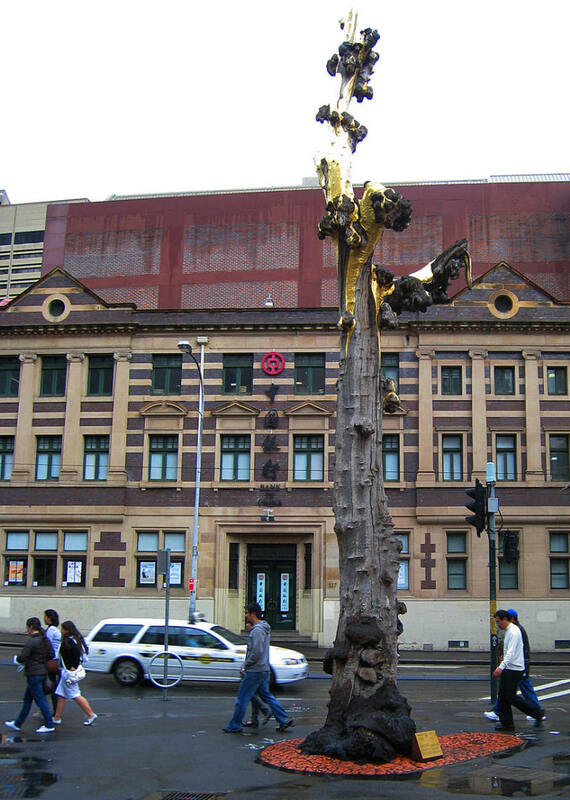 The foreground sculpture, made from a tree stump, and gilded with 23 carat gold leaf towards the upper end, is named Golden Water Mouth and is said to bring good fortune to the Chinese community. 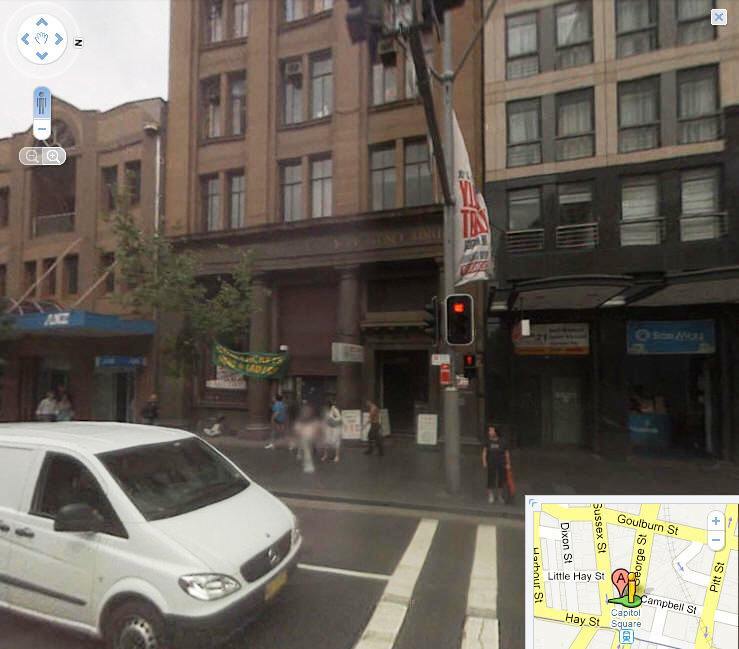 2011 March 8 John Beer advised that Haymarket 681 George St was Savings Bank of NSW, as depicted on a large map on the western wall of hall of Mitchell Library on the left hand side of entrance to the library. From Picture Australia. An early photo of Brickfield Hill with CBC branch shown centre left. 1892 operating as Southern branch - Haymarket, George Street South - C. W. Gaden, Manager (89th Report). Early photo courtesy K Meyer, taken by his father-in-law, Charles Wiseheart, ex Manager Nowra. 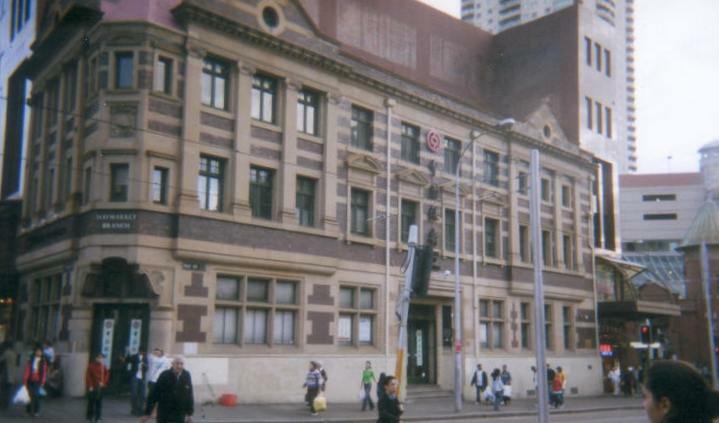 2006 photo of ex-CBC (now City of Sydney Haymarket Library) by John Beer. 2010 March 19 photo of ex CBC Southern branch, Haymarket, now City Library (c) dunedoo on Flickr. I to Z Click at left to continue.